Following to recommendations and to principles of the UNCDE Rio de Janeiro Conference (Earth Summit 1992) in Ukraine, as in other countries conduct active debates and work up plans of successive transition to sustainable development, which provided a permanent balanced decision of socio-economic tasks and preservation of environmental and natural resources. Sustainable development is, according to the "Report of UN Commission on Environmental and Development" (Brundland Commission Report, 1986), a process of changes in which "natural resources exploitation, investment directions, technical development and institutional changes harmonize with each other and they remain now and in the future able to fulfill human needs and aspirations". A similar statement of aims was expressed by the UNCDE Conference during the 1992 Rio de Janeiro, where as a main place in a problem of stable development of a civilization was named anthropocentric understanding of expediency of the savings natural resources and also physical and mental health of the people: "Human beings are at the center of concerns for sustainable development. They are entitled to a healthy and productive life in harmony with nature". Forestry with many other aspects of contemporary life together have joined the current of transformations aimed at reaching the stage of sustainable development (in its broadest sense) of the world. * the human population has been growing at a rate of 92 mln people/year. These conditions have brought about some changes in social preferences and expectations concerning the forest. Still more emphasis is being put on the protective functions, environment-forming and general social values of forests (Rykowski, 1995). The wood is a natural pantry, from which constantly receive raw material almost in all branches of economy. It is wood going on building needs, furniture, production of thousands names of diverse products of use. It is cellulose, paper, viscose, spirit, rubber and other products of chemical processing of wood. From needles and leaves receive ethereal oils, many kinds of food are prepared in a forest, which for many peoples and now are a basis of life, these are mushrooms, nuts, berries, honey. The woods are hunting areas, in the forest the cattle is grazed and fodder is prepared for home animals. Wood is an important natural protective factor. These functions include climate regulation, protection of waters and soils, and keeping the na-tural environment in a state suitable for human life and employment. In summary, forests ensure a healthy environment and the well-being of people. It is impossible to overestimate its field protection role, the wood promotes increase of crops of agricultural cultures, prevents water and wind soil erosion. It clears air of a dust and industrial pollution, reduces concentration of carbonic acid, saturates an atmosphere with oxygen and phytoncides. At last, the wood serves a perfect place of rest for the people. The woods, being a major natural resource, from ancient times constantly serve to the person, which destiny always was with a wood connected. The role of a wood was for the person multifunctional - wood represented a refuge from enemies and bad weather, gave food and dressed, warmed by fire wood, supplied building materials, instruments of work and weapon, medicinal plants, dyes, and also (that is very important) influenced consciousness of the person, its culture and perception of the world. Our great-parents lived in extensive wildernesses, observed their life and beauty every day, learnt flora and fauna, worshipped huge trees and strong animals (Wisniewski, 1997). The identification of a tree and deity naturally has resulted in occurrence of a new image of a sacred wood. The sacred wood caused reverence and fear, it has become the shape of a temple, where the columns were served trunks of trees, and the christian churches and today remind by its arches, twilight and soft, iridescent light, which streaming through stained-glass windows (Bross, 1989). The system of the interdictions in sacred ritual groves was transformed in original interesting culture. Till now many peoples save traditions sacred natural boundary and woods, respectfully concern to trees, animal, which are used without any necessarily, and many trees are not cut (Boreyko, 1995). Unfortunately, the European civilization did not promote development of environmental protection of traditions and only now, under fatal fear of the ecological Apocalypse we must come back to the last moral norms and learn the people to respect and to like a nature, to protect a wood. The Ukrainian wood for a long time were of great place in the life of people, but during the last 500 years forests of the Ukraine were reduced to a third. While in the first millennium forests area in our country was about 27 mln ha, nowadays it is only 8,6 mln ha. Intensive exploitation of the forest resources of the Ukraine, particularly during the post-war period (since 1945), led to their considerable depletion (the amount of forest use exceeded estimated norms by two times and more). Due to excessive felling general state of forests, their age structure, density, forest ecosystem stability, as well as forest stand productivity sharply decreased. Nowadays, sparsely forested Ukraine cannot provide its own needs in timber (annual shortage in timber amounts up to 25 min cubic metres), and forests, as an important factor of ecological stability, cannot completely fulfill their protective functions. The total area of the forest fund of the Ukraine is 9942 thousand ha, including 8620.6 thousand ha covered with forest with the total stock of timber 1319.87 min. cubic metres. Ukraine is rather sparsely forested, on the average, there are 0.17 ha of wooded area and 20 cubic metres of timber stock per capita. The forests cover amounts, on the average, to 14.2 per cent of the Ukraine territory. The forests in Polisya occupy 26.1 per cent of the region's territory, 12.2 per cent — in the partially-wooded steppe, 3.8 per cent — in the steppe, 40.2 and 32 per cent in the Carpathians and in mountain regions of the Crimea, respectively. Comparison of forests in different regions testifies to the unevenness of forest areas distribution (Gensiruk, Nizhnik, 1995). Unfortunately, due to unsustainable forestry, the age structure of wood has been greatly disturbed. New artificial plantations (less than 20 years old) pre-vail, and virgin forests have almost dis-appeared. In Ukraine all forests may be classi-fied into two groups depending on their use and type. The first group includes green zones around cities and industrial centers; pro-tective belts along rivers, near lakes and other reservoirs; field- and soil-protective zones along railways and highways. They total 48.1% of the State Forest Fund. The major functions of recreational forests are the protection of human health, rest, tourism, sport hunting, and environmental education. They have spe-cial importance for Ukraine considering the high density of its population (63.3 people per sq. km) and the extensive amount of land used for agriculture. Most of the pine, oak, and beech forests have a recreational function. They are concentrated mostly in the Carpathians, the Crimean Mountains and around large cities. Unfortunately, clue to intensi-fied stress, 20-25% of forests situated near large cities and resorts, are in se-cond and third stages of digression. The second group includes mostly forests serving as sources of marketable wood. They total 51.9% of the State Fo-rest Fund and are situated mostly in the Carpathians, the Polissya, and the forest-steppe zone. Forests occupy 50% of the territory of the Carpathian region. Besides playing ecological and social roles, they are of large economic importance. Five million people living on the territory of the Carpathians, are connected economically with the mountain forest landscapes (Shelag-Sosonko, Vakarenko, 1997). The future of our country, which was oversaturated within a communist construction period by the industrial giants of the metallurgical, chemical and other certainly of harmful branches, which has transferred Chernobyl accident and still will be long to test its pernicious consequences, in many respects is defined by the attitude of a nation and government to ecological problems, in particular, to a problem of preservation and increase of the area of woods, increase by their protective and recreating functions. 1. Do you consider, that the woods in Ukraine are in good condition, their area is sufficient and nothing threat them? 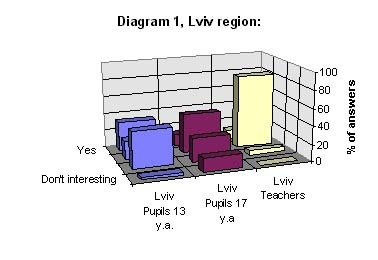 As the majority of the respondents are dissatisfied, by a condition of woods in Ukraine and area taken by a wood is visible from the diagrams, and most this question disturbs the teachers - most conscious and educated part interrogated. It is interesting, that in west, where it is enough of forests also people more often adjoin to them in daily life, of the teacher more concern with their condition. Among the schoolboys with age the concern has a rising tendency. The junior schoolboys give the more absent-minded answers, most of them, as it is visible, the problems do not know yet and have not defined the attitude to it. It is characteristically, that among the senior schoolboys it is more such, whom the given question do not interest at all. In this question understanding of importance of forest ecosystems in preservation of a nature in general unequivocally prevails, and the consciousness it grows with age and educational level. However, among junior interrogated groups (13 years) are inadmissible high (27 in Lviv and 38 in Dnipropetrovsk percent of children, which do not know how to answer). Surprises, that in steppe region there are a lot of children, which this question does not suit. The special interest of results consists that the questionnaire represents two regions of Ukraine - Lviv western (less industrially, with rather high forest-steppe and Dnipropetrovsk east - saturated by harmful production, almost woodless. This difference is precisely reflected in the answers: in Dnipropetrovsk more appreciate a wood as recreation and ecological resource, though less it is known and used. - Among the senior schoolboys the interest to problems of a wood falls, that specifies imperfection ecological work in the senior classes. Nowadays, the major task for forestry lies in its "ecologization" and "sociologization", which will guarantee biodiversity of forest eco-systems and their sustainable functioning for people using. Taking into consideration the low percentage of area covered by forests, and the depletion of forest ecosystems, it is necessary to achieve a forested area percentage of 25-30%, which is optimal for the territory of Ukraine (including 50% in the Carpathians, 40-45% in the Polis-sya and the Crimean Mountains, 20-25% in the forest-steppe zone, and 8-12% in the steppe zone), by planting trees on currently unused and eroded agricultural lands. Presently, it is possible to increase the percentage by 2% by reforesting an area of 1 million hectares of discarded lands. Such actions, as well as an improve-ment of environmental legislation, reser-vation of forests of particular ecological value, and creation of an ecological net-work will facilitate solving the problem of sustainable forest use in Ukraine (Shelag-Sosonko, Vakarenko, 1997). In order to improve ecological situation and to increase forest raw material potential of the Ukraine it is necessary to increase wooded area by 1.5—2 times by afforestation waste lands and I with low productivity unfit for agriculture, to create a system of shelter belts in the fields and along the banks of rivers, to timely and qualitatively carry out reforestation measures and improve feelings in the forests of the national significance to form forest stands with optimum species composition and de using selection-genetic planting material. In order to improve logical situation, to maintain biogeographical diversity and to optimize the state of environment it is expedient to create a united tern of nature protective territories on an area of 6.0—6.5 mln ha with the most typical and unique natural complexes in all physical geographical zones of the Ukraine. It is necessary to create ecological monitoring in order to observe control the state of natural resources and environment and to organize national system of the ecological training in educational institutions. 1. Boreyko V. Ohrana viekovyh dierevyev. Kiev, 1996, 80 p.
2. Boreyko V. Sviashennyye roshi vremion o narodov // Ekologicheskoe obrasovanie na base zapoviednyh territoriy, Kiev-Chernovtsy, 1995, p. 125-140. 3. Bross J. Sviashchennoie derevo // Courier UNESCO, #7, 1989, p.4-9. 4. 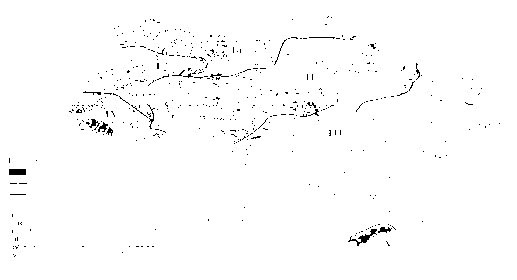 Gensiruk S., Nizhnik M. Geography of the Forest Resources of the Ukraine, Lviv, 1995, 123 p.
5. Shelag-Sosonko Y., Vakarenko L. Forest Wealth of Ukraine // Ukrainian Nature, # 2, 1997, p. 40-43. 6. Wisniewski J. Humanizacja edukacji lesnej - moda czy koniecznosc? // Wspolczesne zagadnienia edukacji lesnej spoleczenstwa, Rogow, 1997, p.147-151.